Weight loss in the elderly is a common problem, and it can also increase their chances of numerous illnesses and complications. Elderly people can lose weight due to issues like stress, health problems, medications, and loss of appetite. If you’re worried that your loved one is losing too much weight, here are some tips that can help put the pounds back on, furnished by Home Care Assistance, a leading provider of hourly, live-in, and Alzheimer’s home care in Harrisburg. 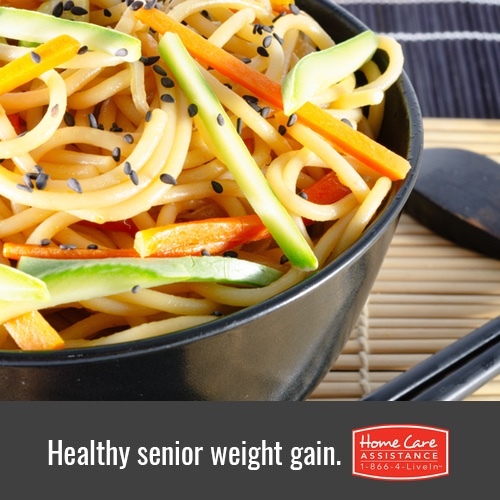 When a senior is struggling with a lack of appetite, a bland meal will do nothing to encourage eating. Many experts recommend making meals more interesting by providing brightly colored foods, which research shows stimulates appetite. Consider red, orange, and yellow foods, placemats, or plates. You can also experiment with new foods or fun food arrangements. Many elderly people don’t eat enough because they can’t manage eating as well as they used to. Holding and using utensils becomes more difficult, and larger pieces of food are a challenge to chew and swallow and can present a choking risk. Try cutting their food into bite-sized pieces, provide silverware that is larger and easier to handle, and serve softer foods, as well as soups and stews. If you need help grocery shopping or preparing healthy and easy-to-eat meals, a Harrisburg in-home caregiver can assist with shopping, cooking, and even feeding if needed. Few people will turn down a favorite food, and this may be the key to helping your loved one gain weight. If your loved one has dietary restrictions that have prevented him or her from enjoying a favorite dish, experiment with healthy substitutions like cauliflower, zucchini noodles, honey instead of sugar, and Greek yogurt instead of mayo or sour cream. Sometimes, your aging loved one may be eating enough but not getting proper nutrition from food alone. If you’re concerned about this, try giving them nutritional shakes as part of their daily diet. These are easy and enjoyable to drink, supply a wide range of important nutrients, and also provide some additional calories. Nothing is more important than your senior loved one’s health, and Home Care Assistance can ensure your loved one is staying happy, healthy, and safe in their golden years. Our caregivers can provide assistance with various tasks including cooking, cleaning, and transportation, and are available 24 hours a day, 7 days a week to ensure your loved one receives care when he or she needs it most. Learn more about our services by clicking here or calling (717) 540-4663 to speak with a friendly Care Manager who can schedule your complimentary in-home consultation. How Can Seniors Spend a Fun Day in the Park?